New analysis and new project! We are writing to let you know about a new project that many of you may be interested in following and potentially getting involved in, as well as a new piece related to reproduction. Florence Johnston Collective is a group of teachers, nurses, non-profit workers, and social service workers who have come together to build active struggles both in specific workplaces, and across workplaces and job descriptions. We have been focusing our work on organizing Home Health Aides as well as hospital workers (RNs, CNAs, custodial, groundskeeping, kitchen, etc) at St Luke’s hospital in Manhattan, which is facing a merger and cuts to workers. In an effort to analyze our world and its meaning for working class people (especially women, queers, and reproductive workers) we have started a monthly writing series hosted on the blog as well, the first about the impending SNAP (food stamps) cuts. Action Saturday and Film Thursday for n.o.n.u.k.e.s. It’s a Celebration and by Any Means Necessary! Come May 5th, Tomari Unit 3, the last remaining nuclear reactor in Hokkaido Japan will be offline, at which point there will be zero nuclear power supplied in Japan. This is a significant victory of the anti-nuclear struggles since the Fukushima Daiichi meltdown in March 2011. Todos Somos Japon in NYC would like to share this joy together and invite all to a communal picnic, a general assembly to celebrate this day. During the past year, as each nuclear reactor shut off and stayed shut due to people’s resistance, the people in Japan have realized that they no longer needed nuclear power; they have never needed it, and the threat of ‘electric insufficiency’ posed by the pro-nuclear force was merely a fabrication. This is a revolutionary shift of mindset that could decompose the nuclear myths; that we cannot live without nuclear energy and a nuclear disaster is something we can overcome! However, their government, electric companies and financial circles are employing all possible means to resume the reactors. 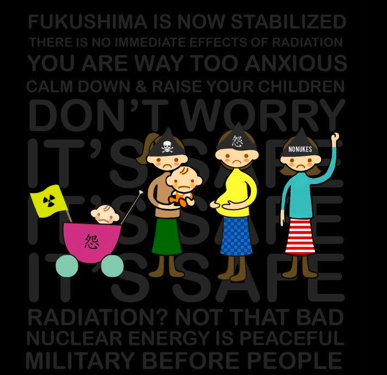 In addition, the people there still continue to live under extreme hardships of radiation exposure, ever expanding beyond Fukushima and national boundaries. So this is just a beginning of a long and broad struggle. And we believe that the “we don’t need it” awakening amongst ourselves is the real beginning of the end of nuclear power on the planet. On this remarkable occasion we invite all for a gathering to share food, our experiences and wisdom. Let us gather and begin a conversation. Come join us! n.o.n.u.k.e.s. screeing of radio activists Friday April 13th in NYC! Radioactivists screening and skype conversation to japan! In New York, the n.o.n.u.k.e.s. crew has been working to make the connections between the nuclear crisis in Japan, the environment, the crisis of social reproduction in NYC, and the fact that we cannot separate the environment from the reproduction of society and the pressures of global capitalism. More information in the screening and n.o.n.u.k.e.s. at http://www.jfissures.org/filmtalk2/! Happy Holidays to our fellow nonprofit workers! Ho Ho Ho, don’t let your bosses pimp you and clients out! This is the first issue of newsletter by Tituba’s Revenge. The creation of this newsletter is part of a working project aiming to develop an anti-capitalist analysis of the material oppression of the communities we work within through fighting against our shared exploitation in the workplace. Our next issue will discuss the relationship between capitalism and nonprofit structure, and how to organize within nonprofits. Stay tuned!